I’ve been tearing through these books, so expect a review a week until I’ve caught up to the end of the series. There’s a reason I’m going through these books so fast. They. Are. Amazing! This one especially so, as it not only introduces some great characters and villains, while at the same time setting up some excellent plot threads for later. The stakes are high as Harry is attacked by some of Johnny Marcone’s, the Chicago Crime Lord, goons in an attempt to assassinate him. At the same time a high ranking member of the Red Court is in town to challenge him to a duel. If things weren’t bad enough, the Shroud of Turin has been stolen, and Harry is hired by the Church to track it down. Unfortunately a breed of deadly fallen angels are after the shroud as well, and won’t hesitate to take out anyone who is involved. Fortunately Harry has some help. Some divine help. Continuing in the mystery novel tradition that Summer Knight set up, Death Masks is as fast paced as its predecessors. So far I have to consider this one my favorite. The driving force of any novel, besides the protagonist, is the villains. Good villains, whether they be complete monsters, or redeemable extremists with good hearts, engage the reader into the conflict. If a villain is goofy then the tension lowers. If the villains kill without remorse, the tension is raised. If the main character can’t defeat the villains one on one, then the tension goes through the roof. This is what Death Masks is like. As with the previous books, Harry faces threats that he can’t face one on one. In this case there are two threats, the demonic Fallen, and the ancient Vampire Lord Ortega. Harry has to not only defeat Ortega in a duel, which by all accounts Ortega is the clear favorite to win, but he also has to avoid the Denarians, twenty demons, one of which has enough power to shrug off Harry’s magic and completely destroy him. Michael, who makes a return for this book, along with two other Knights of the Cross, asks Harry to give up on searching for the shroud, on account of the danger the Denarians pose. Of course Harry doesn’t listen. Susan returns for this book, and even though she’s more interesting than before, by a little bit, I have to say she hasn’t recovered from my initial impression of her. She’s going through her own character arc, but frankly she just doesn’t appeal to me as a character. I think part of the problem is that when it comes to romance in fiction I like to see it as payoff after a great deal of development. It’s why I am somewhat of a shipper (trying not to be, it’s an unhealthy habit) for series where there isn’t any romance in the first place. I see two characters who work well together, and whose relationship is not based around romance, but could be. For me a romantic relationship in fiction needs the right development, and a lot of series I read have plenty of development between characters, even if it isn’t romantic. The relationship between Harry and Susan lacks that development. From pretty much her first introduction she was there as a romantic interest, and until now failed to get developed as a proper character. Death Masks develops Susan’s character some more, but for me it comes across as too little too late. On the other hand there is some spectacular development for Johnny Marcone. I won’t give anything away, but not only is he amusing in this book, while at the same time posing as both a threat and ally, but his reason for involvement in the theft of the Shroud of Turin blew me away at the end of the book. Marcone, evil though he may be, is a fully developed character who I could easily see transposed into the Batman universe, known for its complex and layered villains. As far as the ending is concerned, let me tell you, it is pretty spectacular. The main threads of the book are resolved, but at the same time new ones are laid bare. The book ends with a sense of foreboding, and the events from Death Masks will continue to bear repercussions, much in the same way that the war started in Grave Peril. Old characters are explored in more depth, new characters are introduced. Along with chilling villains, several clever plot twists, and a climax that, while silly, would be amazing to see rendered on the big screen. If you haven’t read this book, go read it. After reading all the other books first. 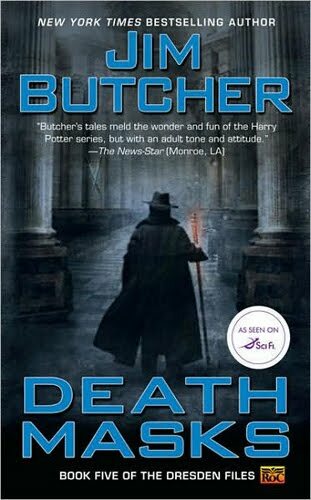 Dresden Files is a series that won’t disappoint.